One of our favorite pieces of luggage is the Samsonite Micro Suitcase Scooter† — it’s a regular-looking wheeled carry-on with a built-in skateboard. Flip the skateboard down your bag will scoot you around the airport! The Suitecase Scooter made us wonder what other products have been combined with skateboards. One surprising such product we found: baby strollers! 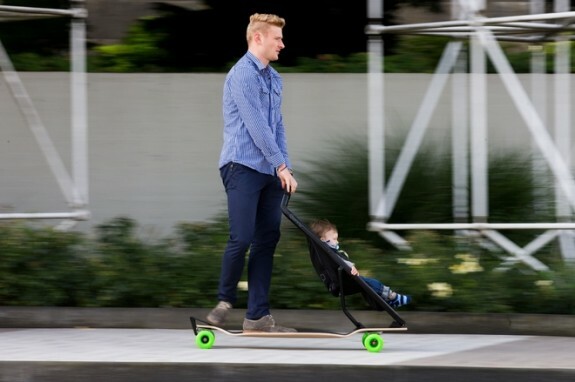 Nothing says “responsible parent” like zooming along with your baby strapped to a skateboard. Or so hope future users of the Longboard Stroller. 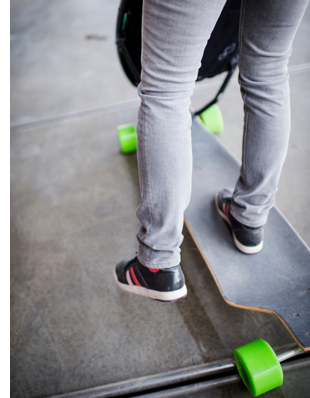 The self-proclaimed “experiment in urban mobility” is exactly what the name describes — an elongated skateboard with a child’s stroller seat attached to the front for balance and steering. (And, oh yeah, it can hold a brave child too). 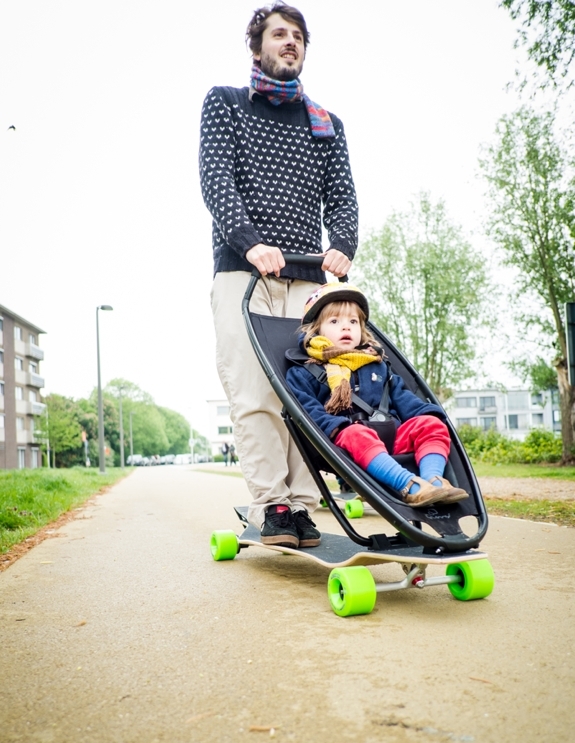 The potential deathtrap unusual stroller is being jointly developed by Studio Peter Van Riet, a Belgium-based design firm, and Quinny, a Dutch seller of baby products. It is Quinny’s involvement in the Longboard Stroller that has us excited about being able to try one for ourselves one day. 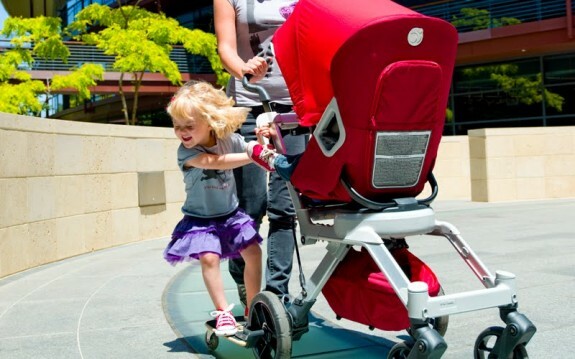 The company is known for their success at bringing highly innovative strollers to market. 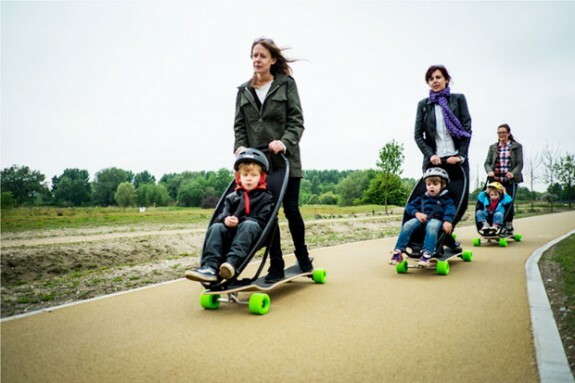 So the potential, at least, is there for the Longboard Stroller to extend the distance parents can travel with their young ones. Skateboarding, after all, is faster than walking — especially when one avoids the temptation to attempt tricks à la Tony Hawk en route. Quinny has already built several prototypes of the Longboard Stroller (seen in the photos on this page) and are testing out several different possibilities for adding brakes. The stroller is expected to accommodate kids from nine months to four-and-a-half years of age. 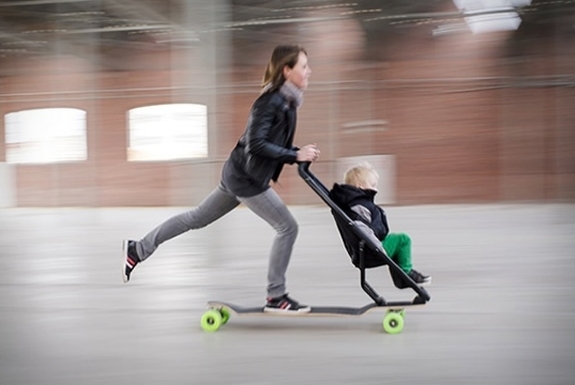 Follow us on Twitter or Facebook for updates on when the Longboard Stroller is available for purchase. 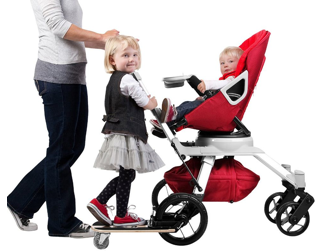 Orbit Baby makes a pair of very cool strollers with a distinctive feature: They’re modular. Once you have the base you build out the stroller that best fits your needs from Orbit Baby’s assortment of seats, cargo containers and accoutrements — including the Sidekick Stroller Board. † Check out our review of the best wheeled carry-on bags for other examples of luggage we love.